"Every week I felt better & better! Staff is super nice!" "He addressed everything and is brilliant in his expertise as a podiatrist." "He really listens to you and isn't pushy when it comes to treating you." "I went there for a crushed big toe. Dr. Michaels saved usability of the toe!" Originally from Dallas, Daniel Michaels, DPM, MS, DABFAS, regards the Frederick-Hagerstown, Maryland, area as home, and it’s where he set up the Reconstructive Foot & Ankle Institute LLC. 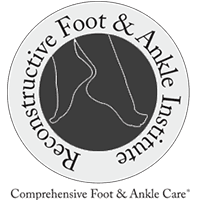 At his two clinics, Dr. Michaels and his staff provide comprehensive foot and ankle care with centers of excellence within the practice, including a surgical center, wound care center, peripheral neuropathy center, heel pain center, weight loss center, and nail fungus center. Dr. Michaels received his Bachelor of Science degree in biology from Texas State University in San Marcos, Texas. Following that, he completed a prestigious program culminating in a dual Masters in Medical Education and Doctorate of Podiatric Medicine degree from the California College of Podiatric Medicine affiliated with the University of California, San Francisco, and Stanford University in Palo Alto, California. After his graduate education, Dr. Michaels completed his internship and residency at VA CT Healthcare System, West Haven Campus, Yale University, School of Medicine, Clinical Campus in Connecticut. During that time he studied peripheral nerve, plastic, and reconstructive surgery. Upon completion of his residency, he served as Podiatric Foot & Ankle fellow and chief podiatric surgical resident at the University of Maryland Medical Center, Baltimore, James Lawrence Kernan Hospital and Mercy Medical Center. At his practice, Dr. Michaels offers a one-stop shop for most foot-and-ankle needs, including nail fungus lasers, digital radiography and ultrasound, shoe stores, foot care supply stores, electronic medical records, custom foot and ankle braces, medical equipment stores, and on-site nerve, arterial, and vein testing. In his free time, Dr. Michaels enjoys spending time with his wife and family, and participating in outdoor sports, such as kayaking, kite surfing, mountain biking, skiing, rock climbing, mountaineering, scuba diving, and hiking. "He really listens to you and isn't pushy when it comes to treating you...I haven't suffered from foot pain in years because of his recommendations and great care." "Dr. Michaels and his staff are superb and would recommend him to anyone! He really cares about his patients!" "Dr. Michael's was wonderful. He resolved my foot complaint and assessed my foot in full. His recommendations were helpful and tailored to my budget."